This edition of Alert features some of the most powerful images from the past year documenting our medical humanitarian work in the field and providing a glimpse into the lives of our patients. In today’s evolving media landscape, a picture often speaks much more than a thousand words. Photography captures vivid scenes of conflict, natural disaster, and massive displacement as events unfold in real time. Powerful images can humanize crises in ways the written word often cannot. For Doctors Without Borders/Médecins Sans Frontières (MSF) the medical act is paramount, but it is not our only goal. We also work to raise awareness about the realities faced by our patients through our commitment to témoignage, or “bearing witness.” This founding principle means that we speak out about what we see happening in the places where we work, and that we help expose the medical consequences of abuse and neglect that might otherwise escape the headlines. We are using photography to shine a spotlight on the longstanding suffering of the Rohingya people, who have been violently uprooted from Myanmar yet again. Since late August, more than 615,000 Rohingya have fled targeted violence in Myanmar to seek safety in neighboring Bangladesh. They join hundreds of thousands of other Rohingya already there, living in dire conditions in makeshift camps. Many of the photographs in this issue come from MSF’s archives, the earliest from 1978, chronicling a decades-long cycle of persecution and displacement. MSF is rapidly scaling up its response to meet the medical needs of the Rohingya and prevent a wider public health disaster in Bangladesh. Efforts range from treating survivors of sexual violence and trauma-related injuries to building latrines and distributing water filtration devices to prevent the spread of cholera and other diseases. After visiting the camps in Bangladesh in October, MSF international president Dr. Joanne Liu said it was hard to comprehend the magnitude of the crisis, calling it “a public health time bomb.” We are doing what we can to help and calling on the international community to do much more. This issue also presents images that underscore the value of our advocacy work through MSF’s Access Campaign to secure medications and vaccines at affordable prices for patients who otherwise would not be able to obtain them. We are among the largest non-governmental providers of care for tuberculosis (TB), the world’s deadliest infectious disease. MSF is using newer medications and new treatment regimes to support patients with drug-resistant forms of TB, and urging world leaders to implement the latest international treatment and testing standards. In Cambodia, hepatitis C patients receiving care in our projects can now access free screening and treatment at a cost to MSF that is slightly over $100—less than one-hundredth the price typically charged for a treatment regimen here in the United States.These are just some of the many measures MSF is undertaking globally to make the provision of health care more equitable. 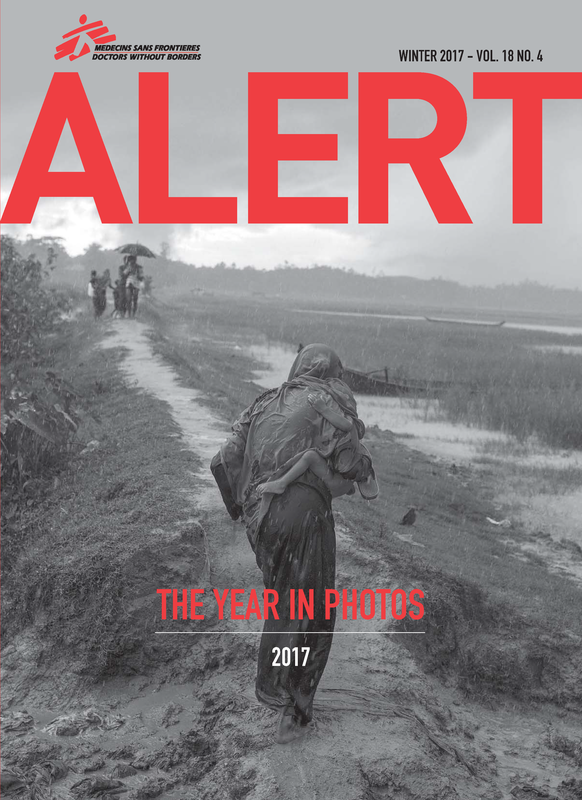 Finally, this issue of “the year in photos” highlights other important contexts that figured prominently in MSF’s work in 2017. In Yemen, MSF helped fight a massive cholera epidemic and continues to provide lifesaving medical care in some of the most volatile parts of this war-torn country. In Democratic Republic of Congo, we responded to a measles outbreak by vaccinating more than a million children against this highly infectious and potentially deadly disease. And in Mexico, MSF deployed a team of psychologists and social workers within 24 hours of a major earthquake to help counsel families who had lost their homes. We hope that these images will help you to see what we see and to gain a better understanding of the essential medical humanitarian aid your generous support helps us provide. These photographs provide striking visual evidence of the impact our supporters can have to improve the health of millions of people around the world. They also show the incredible strength and resilience of our patients. On behalf of all of us at MSF-USA, I’d like to thank you for your tremendous support, and to wish you a happier and healthier new year ahead.